The nearby galaxy DDO 68, captured here in visible and infrared light, was thought to provide a glimpse of a young galaxy until recently. A stunning new photo snapped by NASA's Hubble Space Telescope shines a light on a mysterious galaxy that may be considerably older than it looks. Our own Milky Way galaxy formed about 13 billion years ago, and most galaxies in its neighborhood are similarly old. But one galaxy just 39 million light-years away known as DDO 68 seems to be significantly younger, more like the galaxies lying several billion light-years away. Galaxies evolve over billions of years, so astronomers must study snapshots of them in various stages of development in order to understand the process. Because early galaxies lie billions of light-yearsfrom the Milky Way, they appear small and fainter than their older cousins, making them more challenging to observe. If DDO 68 is indeed relatively young, it would offer astronomers a more accessible target. 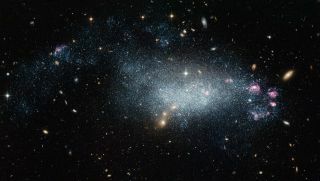 DDO 68, also known as UGC 5340, bears a strong similarity to early galaxies in its structure, appearance, and composition, researchers said. For example, DDO 68 appears to have a less metal-rich environment than its older neighbors do. Young galaxies have fewer heavy elements, or metals, in their chemical makeup because such metals are made in the hearts of starsand are released through the star explosions known as supernovas. As each generation of stars reaches an end, more and more metals pollute the otherwise-primordial composition of the galaxy. Galaxies are also dated by studying the ages of its stars. For some time, the stellar population of DDO 68 was thought to be around 1 billion years old, far younger than the sun’s 5 billion-year age. A recent examinationof the mysterious galaxy in archival Hubble images, however, revealed red giant stars (the next major phase of the sun’s evolution), while other studies also suggest the presence of older stars. When taken with other evidence, the findings suggest that DDO 68 is at least 10 billion years old — not a young galaxy after all. But more complex modeling is required to understand its nature, researchers said.